…the author’s life growing up in a very conservative family of Mormon survivalists. Tara’s father believed that civilization was going to collapse at any moment. The family was constantly busy with the urgent task of burying fuel and hoarding supplies for the end of days. As she grew older, Tara started to get curious about education. She had skipped (in the US parlance) kindergarten, grade school, middle school, and high school; she had, in fact, no experience of formal schooling at all. But in defiance of her father’s wishes, she took a university entrance exam. It was the first exam she’d ever taken, but she scored just highly enough to consider a low-tier university. On her second attempt, she scored enough to be admitted to a respected Mormon university. 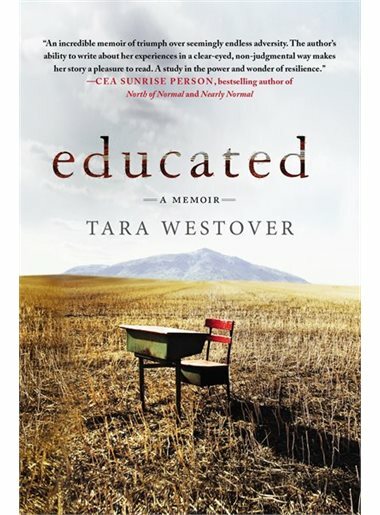 Tara had been so isolated from society that going to university was educational in a lot of ways outside the classroom. She had to learn to use soap regularly, and to get over her shock at her classmate’s ‘immodest’ clothing. She struggled with her own intellectual ambitions, having been taught to believe that women should have no ambition outside their families. In her lectures, Tara was so naive that she once asked what the word ‘Holocaust’ meant. In her art history class, she was well into the semester before she realized that she was meant to read the textbook; not just look at the pictures. She had to learn not only the content of her courses, but also how to study; how to ask questions; how to navigate a society that operated outside the rules of her childhood. Despite all these challenges, Tara showed promise. She read and studied at all hours, determined to understand the history and politics that had been hidden from her as a child. She wrote detailed and sensitive essays, and gained some very powerful supporters among the professoriate. She was encouraged to apply for a study abroad programme in Cambridge, and was accepted. Later, she was encouraged to apply for a highly prestigious Gates scholarship, and was accepted. She went on to earn her PhD against unthinkable odds. However, the more educated she became, the more her family (particularly her father) believed her to be corrupt and dangerous. Becoming a scholar meant losing almost everything she had known. Her loyalty to her family ran so deep that even though she didn’t always agree with them, the pain of losing them is felt on every page. Her choice to pursue her education – even though it meant alienating them – is a reminder of what a free mind is worth. There are as many PhD stories as there are people with (or pursuing) PhDs. For some of us, getting a PhD is an intellectual exercise. For some, it’s deeply personal. In Tara’s story, the PhD represents the power of education as a tool for changing the boundaries of one’s own mind. She didn’t just get a degree, or improved job prospects; she got a whole new reality. ” In Tara’s story, the PhD represents the power of education as a tool for changing the boundaries of one’s own mind. So true. The knowledge one gets out of the PhD journey is far beyond the degree.” For me, it’s the social skills and the so many diverse people you meet along the way. Thanks for a lovely article.